Jack’s has replacement small engine pulleys of all types for many of the major brands. If you need a v belt pulley, spindle pulley, engine pulley, idler pulley, variable speed pulley, or any other type of lawn mower pulley, Jack’s is the place to get it! 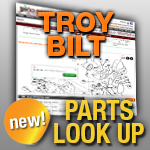 We have the parts you need to help you get your small engine repairs under way. It is important to know that pulleys are not the same as idlers. There are parts called idler pulleys, but they are actually pulleys. The difference is that an idler rotates freely around bearings at its center, while a pulley will have a notch (or some other device) to fix it to a shaft that it rotates around.